Many Christians have a dualistic approach to life. We have our church life and then our work life, which are pretty separate. This track from The Gospel Coalition's curriculum 'Gospel Shaped Church', is about marrying these two worlds together. Its not just about bolting on Christian bits to my working life, but seeing that everything in my life is connected to the gospel. The Gospel is at the heart of everything I do at work, its not just the answer to people's spiritual needs at work. God created us to be workers. To till the soil, to subdue creation. To be his representatives in the world and we flourish when we work as God intended. Take your whole church on a journey to discover how to not only connect Monday to Sunday, but how to put the gospel at the heart of everything we do at work. The Leader's Kit contains everything you need to evaluate the course: a Leader's Guide, Handbook, DVD, Quick Start Guide and SD download code. 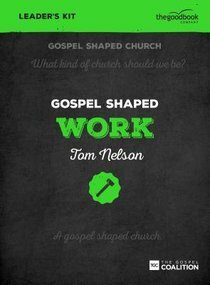 About "Gospel Shaped Work (Dvd Leader's Kit)"
Tom Nelson (D.Min., Trinity Evangelical Divinity School) has served as senior pastor of Christ Community Church in Leawood, Kansas, for more than twenty years. He is the author of Five Smooth Stones; Ekklesia and Work Matters: Connecting Sunday Worship to Monday Work as well as a member of The Gospel Coalition.